The Third Principle of a Simple Health Plan: The Plan Must Be Fun (on some level). Some of you love working out – the process is naturally fun. For those folks who hate long hours on the treadmill and can’t stand the thought of doing bench presses in a stinky gym of preening divas and muscleheads, find something that you will enjoy doing on a regular basis. If it’s tennis, play tennis and find a workout plan that supports your tennis game. If it’s golf, do the same. You like ultimate frisbee? That’s some good exercise. Go do that (on a regular basis). Get outside. Include your kids or spouse or significant other or a bunch of friends. You can also gamify otherwise blah exercise like walking the neighborhood. Just ask my wife about getting the Trail Shoe Badge on her Fitbit app. It was like she won an Oscar. Check the Trail Shoe Badge – impressive! When you make your workout plan fun, you are keeping things simple. You will naturally and easily do what is fun. It makes creating a habit that much easier. Also, one of the ways to make your exercise fun is by joining some sort of community offline or online or by having a workout or playing partner. CrossFit and other training houses are all over the place. Running groups, cycling groups, and adult sports teams abound. At the local elementary school here in the suburbs of Atlanta, I even ran into a full on hurling team getting all Gaelic on the soccer field. The built-in accountability can be powerful. And most sports, as mentioned above related to tennis, have associated exercise programs that can help you improve your game. If you’re a loner, then finding something fun to do by yourself should be simple. I, personally, love to take a brisk walk by myself. It clears my head, helps me think, and is gentle on these youthful, yet aging, bones. Even my loner walks are supported by my little band of Fitbit brothers and sisters challenging each other everyday to hit our step goals. 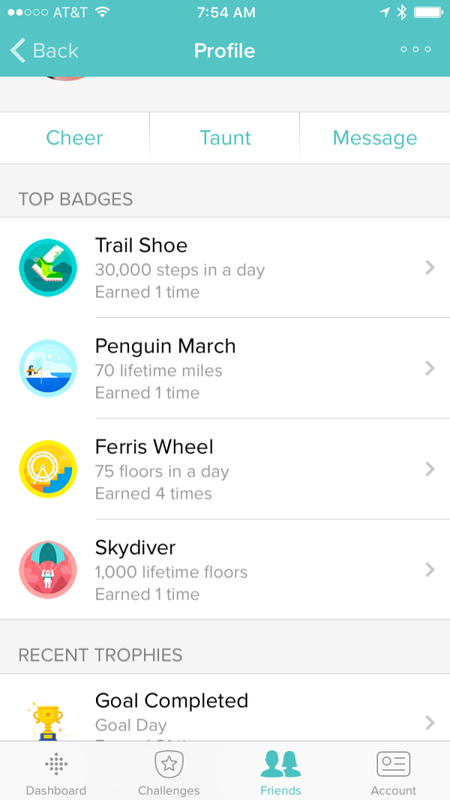 Fitbit gamifies what might be a drudgery without the silly badges and whatnot. Somehow it works. There are a host of online and mobile apps that bake gamification into their exercise advices and programs. Learn to cook in keeping with your meal plan. Take advantage of the communities on social media. Since it’s my current experience, I’ll mention Whole 30. While some might think it tedious to figure out how to cook solely with meat, veggies, fruits, tree nuts, spices, and oils – no grains, rice, legumes, flour, sugar, I enjoy the challenge. Making Whole 30 mayo and concocting dips and sauces is actually a blast (after you ruin your first batch or two). We tend to appreciate food we make more than food that we buy. If you make your own meals, you’ll be more inclined to enjoy them – even if they are all nutritious, healthy, and free of additives. Another benefit: If you get your kids involved, they’ll also start expanding what they eat. If they help make it, they’ll at least pretend it’s good. One other way to keep eating fun is to leverage social media. Learn how to use Pinterest or Instagram. If you’re worried that your friends will be annoyed by your constant photos of your food, then create a separate account for all of your delicious food creations and find your community out on the world wide web. Even your friends in real life won’t mind so much (so long as you don’t blast them on their Facebook feeds all day long). That’s what I’ve done. I get overly excited about getting ‘likes’ on my Instagram pictures of Whole 30 meals (go ahead and click to see my delicious and nutritious creations). I’ve also created a Pinterest board featuring Whole 30 recipe finds. In addition to posting my own photos, I get inspiration by the community of Instagrammers who are posting their own recipes and food ideas. Post pictures using the hashtags of the community that eats like you (paleo, vegan, Weight Watchers, gluten free, etc. ), and you’ll start finding a bunch of likeminded individuals and some natural, built-in accountability. It’s actually fun. If you need help with these social media platforms, sign up for my newsletter, get one of my emails, and shoot me a reply (or leave a comment below). Keep your simple health and fitness plan fun. We don’t need to drain our self-discipline by powering through our exercise and eating gag reflex. Life’s too short. But make sure you get out there!